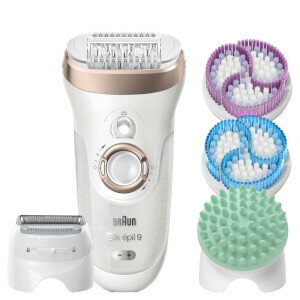 Braun present the 7561 Silk-Épil 7 Epilator; a cordless Wet and Dry Epilator that performs thorough hair removal, leaving silky soft skin. Designed specifically for epilation in warm water to improve your circulation and make your skin less sensitive, the epilator is waterproof and washable. With 40 tweezers in close-grip technology, the epilator removes even the shortest, finest hairs right down to 0.5mm long. The epilator features a pivoting head, which smoothly adapts to your body contours, and SoftLift Tips, which effectively lift even flat-lying hair and help guise them to the tweezers for removal. A Smartlight also helps guise your way through the epilation and lightens up even the finest hairs.